Those that are into or interested Motocross bike riding either for pleasure or racing all have their own bike preferences. Some have the opinion that they want the best on the market at any given time. This means that they will trade their bikes often. Others still believe in the bikes from the past and will do their best to keep their older bikes in the best condition possible. Both categories of bike owners have a keen interest in what the motocross bikes of the future will be like. There are a lot of bikes that can be reviewed from the past, but some stand out more than others for a variety of different reasons. When it came to looks this bike did not differ much from the 1985 model. Where the big changes were most noted was on the track where it counted. The most significant change was the significant increase in power. But, as this was and is such a popular sport it wasn’t long before it was replaced with a bike that was considered faster and more powerful. 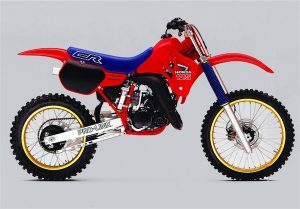 Although the YZ125 had been around for several years and over the years newer versions of it were created. There are still motocross enthusiasts today seeking out these bikes for the purposes of refurbishing them. To look at this category of bike it can still include many from the past but for those that are wanting to buy a current year bike then it means looking at the 2018 bikes. This bike was one that many got excited about in 2017 but were even more impressed with the 2018 upgrades. This included the elimination of the Kickstarter with a replacement that is fully electric. The standard map has also been configured. The year 2018 was the one for some significant updates to this motocross bike. It still possesses some of the important features of previous versions, but it comes with a brand-new look. The launch assist mode has been updated, and the 2018 version possesses a new coil spring fork. Some are disappointed that the updates didn’t include the addition of an electric start. For those looking for a motocross bike that has gone through a total change then this is it. It has been fitted with a new motor and it now has an electric start. What has not changed is the reverse head and top size. The suspension that this bike is known for is still considered to be the best there is. Some extra perks are the new phone app. Every year motocross bike owners are filled with anticipation wondering what the new bikes of the year are going to possess. Some speculate that artificial intelligence will find its place into the motocross sport. There is already talk about AI being used in motorcycles to allow for the adaptation of the riding environment and the skills of the rider. More that are looking at the future for the motocross bikes believe that advancements are going to continue as they have done for many years. With all the focus being put on speed and performance followed by comfort. Cost factor is always going to be a consideration and most likely they will always remain relatively expensive.